1. The Hooligans (Devin & Mason Cutter)-The fat, flippy, bearded bullies did what they do best over the weekend. Compete and win. With 3 shows in 3 states and 5 matches overall, their drive to succeed paid off this week. They had a weekend record of 4-1 at Strong Style Wrestling (a loss to the Pain Killers), Pro Wrestling Glory (3 wins to win the Glory Tag Team Tournament), and THW. Very few teams are as motivated to succeed as them and this week was just one more example of that fact. #3 in the online poll with 57 votes. 2. The Decade (Roderick Strong, BJ Whitmer, & Jimmy Jacobs)-The former #1’s in the Tag Team Top 5 scored yet another victory over the weekend as they defeated Adrenaline RUSH & Caprice Coleman on 3/22. They are 3-0 as a 3 man team since forming. Whitmer & Jacobs are 4-1 as a team since reforming. Overall they are 7-1 (7-0 in ROH) since becoming a stable. 3. Men of the Year (Michael Elgin & Ethan Page)-The AAW Tag Team Champions do nothing but win and yet again, that’s what they did as they took on OI4K on 3/22 at Epic. They are now 4-0 as a team and show no signs of stopping. The 2 time former #1’s in the Tag Team Top 5 are attempting to stake their claim as one of the best tag teams in the world. 4. The Briscoes (Jay & Mark Briscoe)-For a team who doesn’t team on a consistent basis anymore, they’re pretty unstoppable. They once again defeated Adam Cole & Michael Bennett at ROH Flyin’ High on 3/22 to improve their record to 4-1-1 as a team in 2014. The only thing they’re lacking at this point is some gold. Could they return to the tag ranks at some point and claim yet another tag team title reign for their collection? 5. BULLET CLUB (Karl Anderson & Doc Gallows)-The IWGP Tag Team Champions defeated Captain New Japan, Hirooki Goto, Manabu Nakanishi, Ryusuke Taguchi & Tomoaki Honma at NJPW on 3/17, defeated Hirooki Goto, Manabu Nakanishi, Ryusuke Taguchi, Tiger Mask & Tomoaki Honma on 3/19, lost to Hirooki Goto, KUSHIDA, Manabu Nakanishi, Ryusuke Taguchi & Togi Makabe on 3/20, defeated Ryusuke Taguchi, Togi Makabe & Tomoaki Honma on 3/22, and lost to Great Bash Heel (Togi Makabe & Tomoaki Honma), Hiroshi Tanahashi & Ryusuke Taguchi on 3/23. They have won 6 of their last 8 matches and are 11-7 in 2014 as a team (2-1 as a 2 man team). They show no signs of stopping on their way to a potential first #1 in the Tag Team Top 5 in 2014. 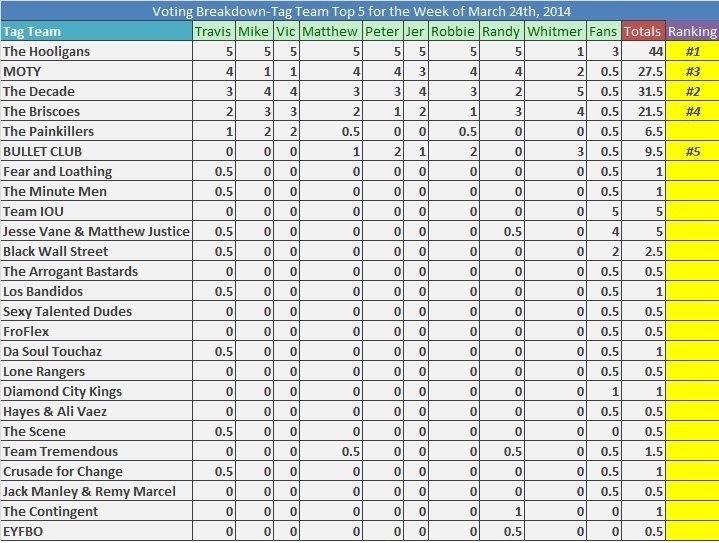 ← Who should be #1 in the Tag Team Top 5 for the Week of 3/24/14?